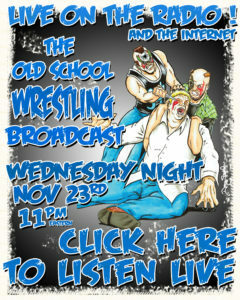 Old School Wrestling Podcast » Blog Archive » LISTEN LIVE TONIGHT! OSWP THANKSGIVING! LISTEN LIVE TONIGHT! OSWP THANKSGIVING! Posted on 11/23/2016, 11:20 AM, by Black Cat, under Spontaneous Prose. Listen live tonight, Thanksgiving Eve, at 10 PM Central, 11 PM Eastern! Click to launch our web stream! first time listener, thanks for the entertainment tonight while im working brotherrrs. woo! Kind of weird to not hear any cursing on the show. side note I hope you go to Ted’s crib for Starrcade Christmas. He has Chef Paul Gilmartin & Chef Annabelle cooking up sum Vader Tater Tot, Nacho Bowl Madness with melted Cheese, and main event dish Hulk Hogan Hoagies. Plus Ted is having Joe Bob Briggs show a special cut of “Babarella”.